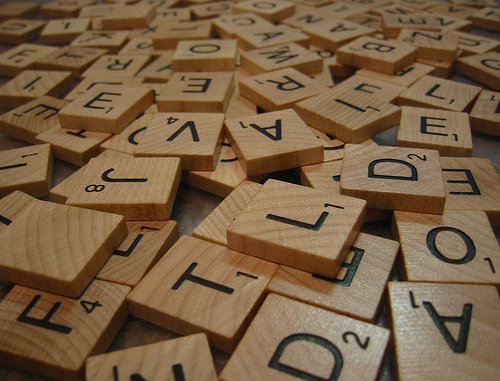 My Scrabble playing may have gotten out of hand. Not because I’m putting it before schoolwork, or starting games with every person I can think of, or finding myself supremely annoyed that I have no vowels so much so that I think about it when I’m actually going about my day– those are all things I can deal with gracefully; the real problem is that I think it’s affecting my vocabulary. Logically, it should be improving my vocabulary, but I try to make words that are not actually words so often that I think I’ve started to convince myself that these words are real. Surely I can add an a or an e to the end of livid, why is ie not a word when aa is? Why is ew not a word when I say it all the time? Why doesn’t the game include more than 1 ‘z’?etc. etc. etc. (also not a valid word). These are the burning questions bouncing around in my atrophying brain. It’s amazing how far I can take this procrastinating. Anyone up for a game? What is it with my sidewalk? A couple months ago, I was rinsing out my coffee pot first thing in the morning when I noticed a man unloading a black leather couch onto my sidewalk. Because it was 7am and I was both sleepy and confounded by what I was seeing, I did the cartoon blinky thing trying to figure out if this was real or not. It was, and this stranger was deliberately unloading a piece of furniture specifically onto my sidewalk instead of any other available piece of concrete– or the dump. I found this annoying, and unsightly, but before I could go outside and demand why he was leaving it there, he was gone. I went to work, and when I came back, I found that someone had torn the couch apart taking out the metal springs and who knows what else. They had also left a chrome shelf, for some reason. I was going to write a blog about this and include some pictures, but by the time I remembered to grab my camera and go outside, the whole mess was gone as mysteriously as it came. This morning there is a new couch (and loveseat!) on my sidewalk. I wasn’t awake to see it being dropped off, but it certainly wasn’t there when I went to bed last night, or when I got up at 3am. This one either came torn apart, or someone went to town on it while I was still in bed, either way, it is unsightly and does not belong on my sidewalk. The worst part of this whole situation is that I just don’t know why. 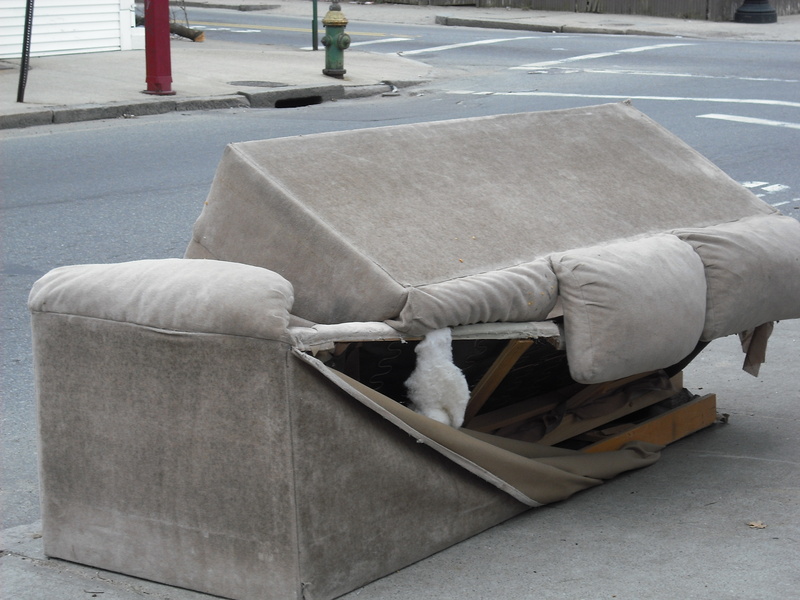 Why leave couches on my sidewalk? Why take the time to load it up in your truck, and then bring it to my place? Why do these couches keep vanishing, when the boxes I put out for the garbage man didn’t get picked up and are now blowing around the neighborhood? I guess it’s kind of an adventure: What’s going to be there when I get up in the morning??? But I just don’t know if it’s worth it if I can’t get any answers. But what do you mean by that, Drunk Man? The bi-monthly pub quiz I’ve been going to for almost two years always has a few themes worked into the questions. The themes can be based on the time of year, something topical, or something totally random. For instance, with St. Patrick’s Day looming, the themes this Sunday were Saints, the color green, NCAA Basketball (unfortunately), and random Irish stuff. Early in the game Gentleman Caller and I both noticed an older gentleman sitting at the bar and drinking a cloudy yellow cocktail in a martini glass. We debated for a while over what it could possibly be. I said lemondrop, he said “that’s a shot”, I said “maybe it’s both”, he said “how would bartenders know what to make you when you ordered that if it’s actually two things?” etc. The old man at the bar seemed quite happy with whatever it was that he had ordered, and we promptly forgot he was there as we delved into the intense world of quizzing. Regardless of what it was, it certainly didn’t make much sense, and after he left in a huff there was the collective look around in bafflement before we continued on with the answers to the visual round. Even though it’s the least important thing in the world, I still wonder what the drunk guy said, and more importantly, what he meant by it. Was he angry? Was he trying to be funny? Did he just want attention? These are the things that stick in my head and render me unable to accomplish things. Years ago, I was at Big Sky Resort in Montana and I met a guy from Mississippi, who not only assumed after hearing that I was from North Dakota that I was racist, but who also asserted that I had probably never even met a black person (I guess he just assumed I hate and fear the unknown). I spent the better part of the night following him around demanding to know what would make him think that. I wasn’t really offended because his accusation wasn’t based on anything I had done/said, and I’m not racist, just intrigued as to why someone would boldly make that assertion since all he knew about me was that I currently lived in Fargo, ND, a place I’m sure he hadn’t and will never visit. He was drunk as well, and I never got a real answer out of him. That clearly still bothers me, as well, but would it kill people to be a little less cryptic so I can go on with my life? This is the week where I can truly take my slacking to a new level. I have done the absolute bare minimum of homework up to this point, and have also started freaking out about my sloth while re-watching old episisodes of Friends and planning home improvement projects. My apartment hasn’t been this clean in a long time, and I’m doing laundry regularly— All in an effort to avoid homework. So now that it’s officially Spring Break and I can officially slack (or, as some think, get ahead on homework), I’m taking this full on. I have a stack of books and DVDs that I’m going to read/watch for pure pleasure rather than to learn anything; I’m going to run for as long as I want every single day and not feel guilty because I can’t read or research while I’m doing it; and I’m going to paint my front room a lovely shade of light blue. All of this, coupled with the extra light in the evening, will jump-start my ambition clock, and make me actually do homework for once, not just agonize about that fact that I’m not to the point of giving myself blinding headaches. Yesterday, I read, ran, did some laundry, and then made home-made macaroni and cheese while listening to This American Life— “Stuff White People Like” living at it’s best, I’d say. Then Gentleman Caller and I had a lovely meal of the aforementioned mac and cheese, salad, vinho verde, and went to pub quiz where we failed miserably due to our atheism and lack of knowledge about Catholic Saints. I say whatever. Point is, I need this. Regardless of my dim job prospects, for this week only, I’m going to pretend that I’m a grownup. When I used to commute to Newport, the toll bridge took tokens or cash. It was $2 cash, or 1 token that cost $1– naturally, I bought tokens. After I got laid off, I had about eight of the stupid things left, but managed to use up some more returning a library book, and visiting Don the appraiser. On my last visit, I saw the blinking sign announcing that the bridge would be switching to E-Z Pass, and tokens could be redeemed in the E-Z Pass office. I saw that I only had five tokens left, but $5 is nothing to sneeze at, and the E-Z pass office is only slightly out of my way, so I went. What I found when I got there was not an office so much as a trailer with three parking spots in front of it. I went in and saw that most of the trailer was taken up with a giant paper-covered table, and a row of metal folding chairs along the perimeter, most of which were occupied by old, old men. There were three frat bro types clearly in charge of the operation and all wearing khaki pants, blue shirts and ties, and looking exactly the same except for a slight difference in height. “Can I help you?” one of them asked me eagerly. “Yeah, I want to redeem these tokens.” I showed him the five tokens resting in my palm. “Do you want to apply that amount to your E-Z Pass account?” he asked. So I had to fill out a form, give him my tokens which he threw into a giant bin, and now I’m waiting for a check for $3.25 to arrive in the mail. There was another woman there at the same time as me who had an entire freezer bag full of tokens (why would a person have so many when you buy $10 at a time?). She seemed baffled by the whole process, and the frat bros kept eagerly volunteering to get her a receipt (which they had to go to another building to do). It was kind of like voting, but with tokens. I finally have my door-desk! After five months of resting on my floor looking a bit strange, the door that I found in my backyard is painted and pretty, and the top of my brand new desk. I bought two filing cabinets to rest the door on, and bought a rolly desk chair at IKEA. I’m now, two months from graduation, prepared to be the super-student that I’ve always told myself I would be but never followed through on. When I was little, and growing up in the teeny tiny town of Hallock, MN, one of the most fun things to do was to drive to the big city of Grand Forks, ND. That’s where the mall was, the movie theatres, and (I thought) the sophisticated people. One year, for my birthday, my mother drove a vanful of squawky pre-teens to the mall, out to late lunch, and to a showing of Weekend at Bernie’s at the dollar theatre. Considering my friends and I were only about 11 years old, this was a rather risque choice for my mother, but paying $.99 apiece was clearly a lot more appealing than full-price for more family-friendly fare. That’s the last time I saw Weekend at Bernie’s (that I can recall, although I’m sure I caught a late night showing on USA or TNT), and I remember liking it quite a bit– laughing a lot, and respecting my mother afterward for choosing so well. A while ago, Gentleman Caller and I got to talking about Weekend at Bernie’s both the first one, and the sequel. So I decided that we should Netflix these movies, watch them, and then have the answers to these burning questions. Yes, as Joe Roch pointed out, I could have gone to imdb and read a full synopsis, but that may have left me with questions, so I decided to be thorough. To sweeten the deal, I suggested that we watch these movies at Gentleman Caller’s house where the heat is free and there is a blender. We turned up the heat, put on Hawaiian shirt (for him), and sundress (for me), ordered Hawaiian pizza, and drank pina coladas. Unfortunately, even drinking rum to excess doesn’t make these movies good, and I was left wondering why the hell I even though Weekend at Bernie’s was entertaining. I didn’t expect it to be smart, but I expected to have a few mindless chuckles and enjoy myself– not so. It was slow-paced, and Andrew McCarthy’s character was so annoying that I couldn’t enjoy it at all. The second one, I’m not even going to talk about– it was beyond horrible. So I’m a bit bummed about the fact that I couldn’t enjoy these movies at all, but I’m willing to try again– With Teen Wolf and Teen Wolf Too. I just need to come up with a cocktail and overall theme that goes with teenage lycanthropy. Not only did I antagonize and enrage my friends, but I went to the mall on February 28, and bought stuff while I was there. Yes, I did, I admit it. I confessed immediately to Joe Roch and Sassy Redhead. I haven’t decided what all I’m going to return yet, but I willfully shopped and spent like some crazed movie character. No Buy Month made me crazy because all I could think about was money– spending, not spending. Clearly this is a plan far too extreme for me, so I’m going to try to be more successful in the month of March– financially speaking. I am going to stick to my budget and live within my means. I’m going to do a thorough inventory of my closet and start making a list of what clothing items I need rather than just buying willy-nilly. I’m not going to use the word willy-nilly anymore. It’s a book soaking in rice, what does it look like? Long before I got into the “no-buy month” thing, I started carrying a bottle of water with me everywhere I went. This is part of the reason I carry such a gigantic purse. The reasons are threefold: I like to stay hydrated and enjoy drinking water, I hate paying for bottled water when if I have a container designed to let me travel with water, and because I grew up in the Midwest where the “winter survival kit” is a must and parents and older people get very, very angry with you if you don’t have one. I’m not saying I carry a winter survival kit with me at all times, or even have one in my car, but I always feel like inevitably I’m going to be stranded somewhere where I’ll be cold, possibly hungry, certainly thirsty. This is why I almost always have a jacket or sweater and carry oatmeal in one of my purse’s side pockets. The only problems up to now, are the fact that I’ve been drinking exclusively out of a Nalgene bottle for about four years now, and if what they say about the plastic leaking chemicals into your drinking water is true, then any potential babies I may have will most likely have flippers. Also sometimes I forget it places, and once it rolled under my couch without my knowledge which prompted me to re-visit every place I had been that week and ask people if they had seen my water bottle. Then this week the stupid thing opened up in my purse and dumped 1/2 quart of liquid all over my possessions and my library book. The book doesn’t look terrible, it’s a bit puffy. Certainly it’s not as bad as that copy of We were the Mulvaney’s some lady returned to the library after dropping it in the lake– but clearly something needed to be done. When he saw the state of the book, and me unsuccessfully trying to squeeze water out of it, Gentleman Caller got very excited. I said yes, and the book has been sitting in a rice bath for a few days now. The fact that it’s Minute Rice may affect the process somewhat, but since I’ve never done this before, I really have no idea. Gentleman Caller has never done this either, but said he’s always been curious. He’s a scientist, so I trust him– also, I know rice can act as a desiccant cause, well, I know things. It does seem like it’s taking quite a while, but I have one more renewal, so I’ve got plenty of time. In other news, I haven’t seen my boss in nearly two weeks. I got one email from him saying he’d be out of the office last Wednesday, but he wasn’t there on Thursday either, nor was he there today. I make a point of adjusting his chair so he knows I’ve been there, but then I just go home. I wonder if he’ll be in tomorrow… My job kind of rules.